Since 1916, Erie Playhouse has brought a lot to the stage: from student productions to Broadway performances, from comedies to dramas, and of course, all manner of musicals. This fall, the pillar in Erie's theater scene is kicking off their 102nd season with the opening of, Hello, Dolly!, a hit musical that debuted in 1964. 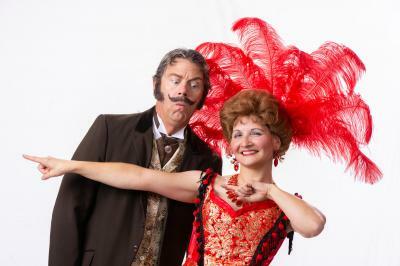 The music and lyrics were written by Jerry Herman who found inspiration in Thornton Wilder's 1955 book The Matchmaker. The tale follows Dolly Gallagher-Levi, a widow and talented matchmaker living in the greater New York area at the turn of the century. Hello, Dolly! 's combination of humor, romance, lively musical numbers and dance has continued to impress throughout its four Broadway revivals. Through the years, the musical has earned 15 Tony Awards including Best Musical and Best Revival of a Musical. During this run of the show, Dolly is played by Karen Brennan. Her co-star, Richard Tryzbiak, plays a widowed, affluent and authoritative older gentleman named Horace Vandergelder. Dolly's line of work as a "woman who arranges things" leads her to Yonkers, New York to find Horace a bride. Other notable cast members include Rebecca Ropelewski as Ermengarde, Horace's niece, and Seamus Clerkin as Ambrose Kemper, an artist who has his mind set on marrying Ermengarde. Cornelius Hackle and Barnaby Tucker — Horace's chief clerk and his assistant, respectively — are played by Josh Lapping and A.J. Ferretti. 7:30 p.m. // 13 W. 10th St. // For more showtimes and ticket information, visit EriePlayhouse.org.